In 1969, when I first became a police officer at the Glendale (CA) Police Department I began collecting police shoulder patches. I wrote a letter to the United States Virgin Islands Police Department and asked for a patch for my collection. They responded to my request with the badge that is displayed to the left. They told me that they did not wear shoulder patches. I was so impressed with the badge, that I never collected police patches anymore. I started asking for and collecting police badges. 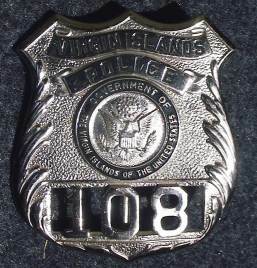 Shortly thereafter, the shoulder patches that I had amassed were traded with an attorney in Ottawa, Ontario, Canada for a small collection of police badges. Since that time, I have never looked back, only collecting metal police badges from all over the World. This is one of my favorite sites; try it!! This is the badge that started it all!